*Barham Mendelsohn is a joint venture project between Jim Clendenen and the vineyard owners Barbara Barham Mendelsohn and Richard Mendelsohn. This wine is 100% Pinot Noir sourced from the certified organic Lala Panzi Estate. In 1998, Barbara Barham Mendelsohn and Richard Mendelsohn planted 5 acres of Pinot Noir on Lala Panzi Ranch in the Russian River Valley near Healdsburg in Sonoma County. 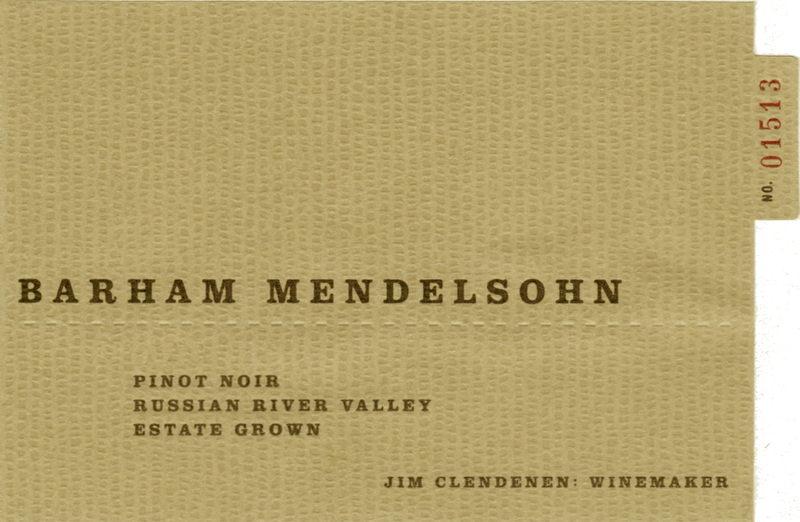 The Mendelsohns engaged successful and experienced viticulturalist Fred Peterson to direct the planting of 6100 vines. He recommended 5 clones: the 114, 115, 667, and the 777 clones from the University of Dijon in Burgundy, and the traditional Pommard selection from UC Davis. The farming protocol at Lala Panzi includes: stringent canopy management, organic farming, manual tilling and weed control, micro-management of ripening assessment, and ultimately a quick, early morning harvest at the best possible balance. Once again, no adulteration was made to the grapes. The Pinot Noir is a result of the growing conditions extant at Lala Panzi, and careful harvest decisions made by the viticultural team. The wine underwent a 14 day fermentation and was aged in predominately new Allier and Vosges forest wood, coopered by Francois Freres of St. Romain. The wine was racked once after malo-lactic fermentation and bottled unfiltered.